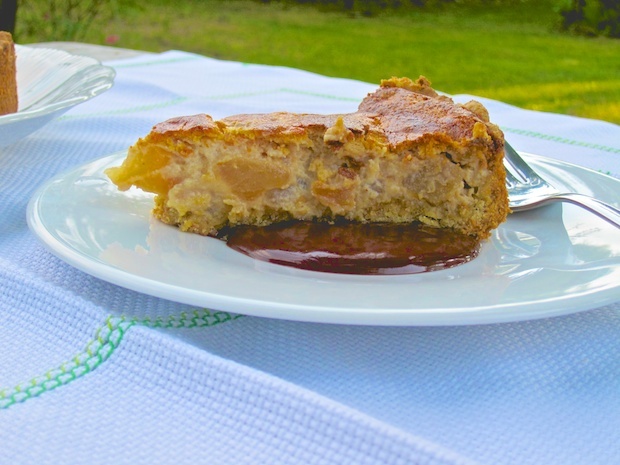 Back from a trip in Salerno, my sister in law Michela praised the goodness of a tart with Ricotta and pears, tasted in a note pastry of the city, and I was so curios about that. In my garden I have several pear trees, and many of them, ripen in that period so, i’ve thought that finding another way to use these fruits, was really a good idea. I decided to “reconstruct“ the recipe, through the sensations that Michela gave me with her story, and i’ve cooked the sweet that I’m presenting. This recipe is suitable also for those suffering from celiac disease. Peel the pears and cut into cubes, put them in a saucepan with the brown sugar, vanilla, white wine and cook for about 20 minutes over medium heat, then turn off the heat and let stand. Place in a bowl the flour and the chopped butter and, using the hands, add the flour with the butter pieces, creating some crumbs. Add the sugar, a pinch of salt and the egg yolks, mix quickly forming a ball. If the dough does not bind, add 1 tablespoon of cold water. Wrap in plastic wrap and let stand in the refrigerator. Turn on the convection oven at 170˚, whip with a pinch of salt the egg whites. In a bowl mix the ricotta with the sugar, giving them a creamy texture. Add the pears with their cooking liquid, the candied orange peel, and then mix the egg whites beaten stiff, stirring slowly from the bottom up so that they do not can disassemble. Put the parchment paper in a baking tray with a diameter of 24 cm. Place the pastry in order to create a sort of box with high sides. Pour the filling and bake for about 45 minutes. The cake should be browned on the surface. Remove from the oven and let it stand. For the sauce, put to heat the milk and, when it boils, pour in the chocolate pieces and stir until the chocolate is completely melted. Serve in slices, accompanied with a spoonful of chocolate sauce.